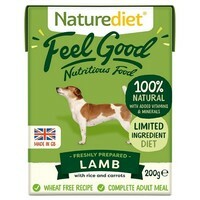 Naturediet Feel Good Lamb is a complete meal made with tender British Lamb, nourishing Rice and a selection of healthy vegetables. Gently steam cooked to lock in all of the delicious flavours, this single protein meal is 100% natural and will provide your dog with all the essential nutrients they require for a healthy lifestyle. Feel Good Lamb is gently on digestion and can be particularly beneficial for dogs with tummy troubles.